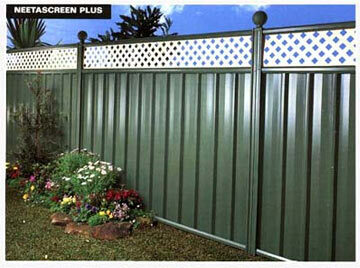 Colorbond fencing & colorbond fencing repair Ipswich servicing the home and building industry Ipswich Brisbane. We are an authorised Bluescope Lysaght Colorbond distributor. These Fences set a new standard in style as well as adding value to your home. 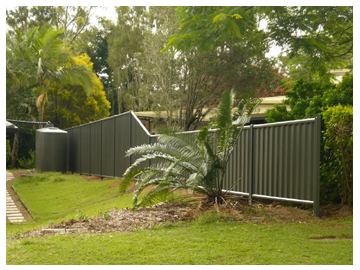 Colorbond fencing is manufactured from quality all-Australian Bluescope Lysaght Colorbond pre-painted Steel or Zincalume Steel, so it won't crack, chip peel or warp, even in the harshest climate. 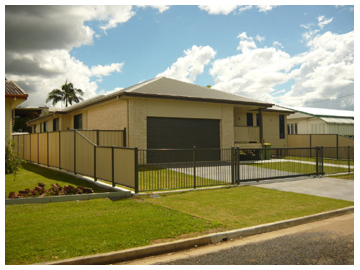 You can choose from a wide range of Colorbond colours that can be mixed and matched to set off your home perfectly. There are 6 profiles to choose from. All are unsurpassed for low maintenance, durability, wind resistance, security and privacy-there are no see-through cracks, plus resistance to fire and termites.In fact, Bluescope Lysaght Colorbond fences are certified to withstand wind gusts of up to 216 km per hour. Bluescope Lysaght Colorbond fences are designed to Australian Standards and are available in 1500mm, 1800mm and 2100mm heights. Panel lengths are 2.350mm. A full range of accessories, including gates and decorative post caps are also available. Bluescope Lysaght Colorbond fencing is covered by an exclusive 10-year warranty when it is installed and maintained in accordance with specifications.